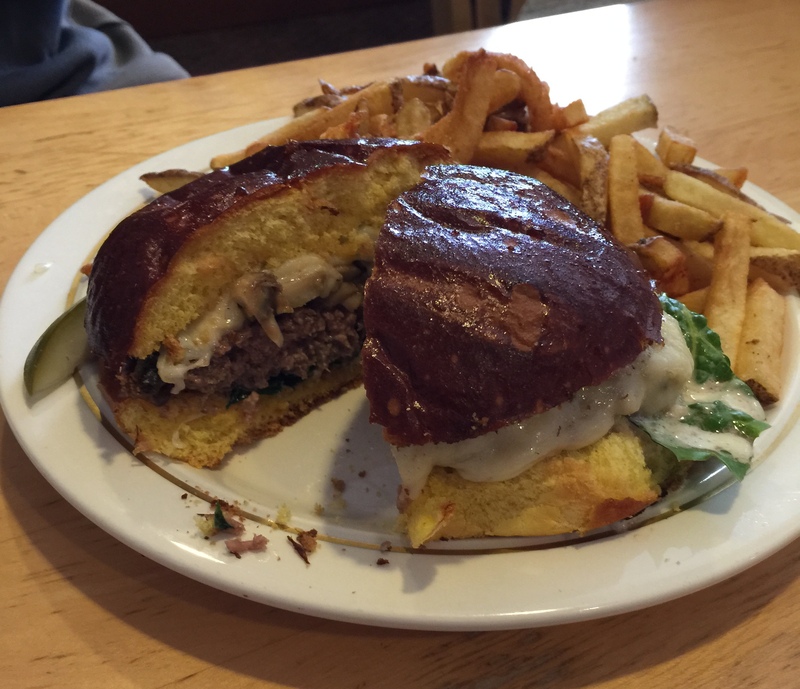 We asked our Facebook group members for suggestions for burgers in Racine and Kenosha Counties, west of I-94. We got a slew of suggestions. 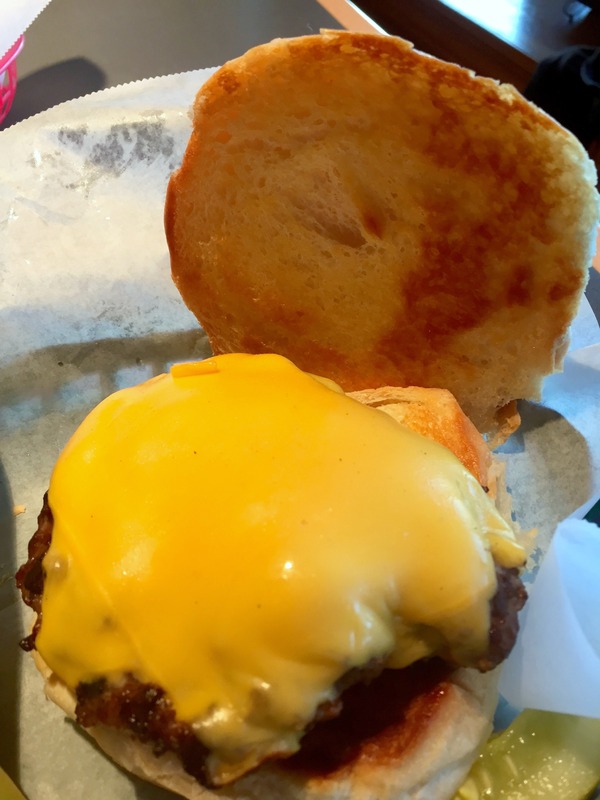 It was very difficult to narrow it down to three places – who doesn’t love a burger in a dive bar? 1. 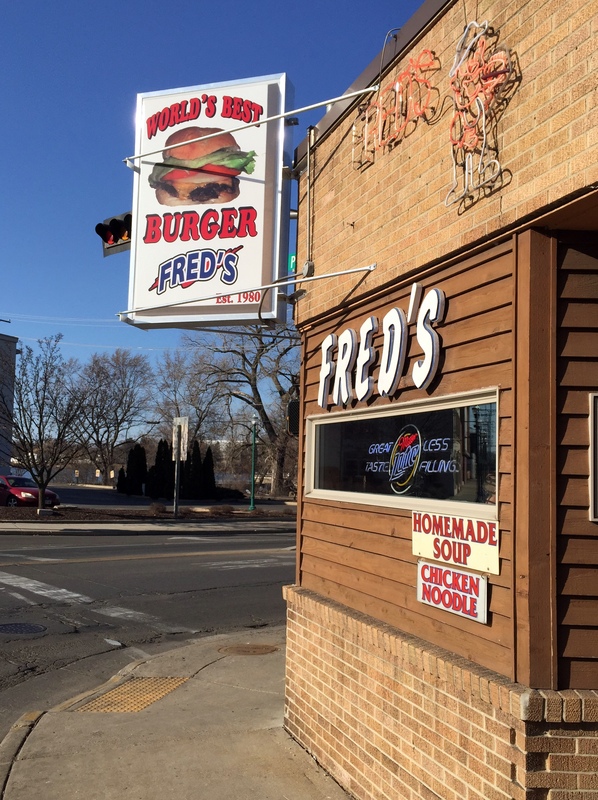 Fred’s – 596 N. Pine Street, Burlington, Wisconsin. 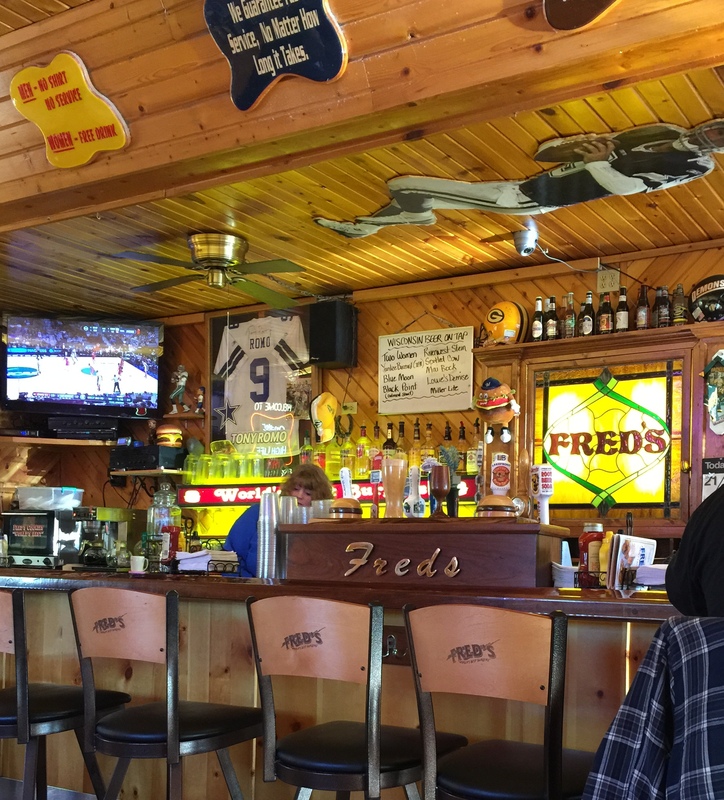 When you enter through the front door, Fred’s looks like a clean, updated, local bar. As you make your way to the back, newer addition, there are quite a few tables filled with families. There are no waitresses; you place your order at the bar in a designated order area. Fred’s places pads of paper at the tables to write down your order to help remember it. The menu includes some out-of the-ordinary burgers with a several cheese and sauce choices. the “Cowboy Burger” for $5.09 which either was a special or an addition to the menu. 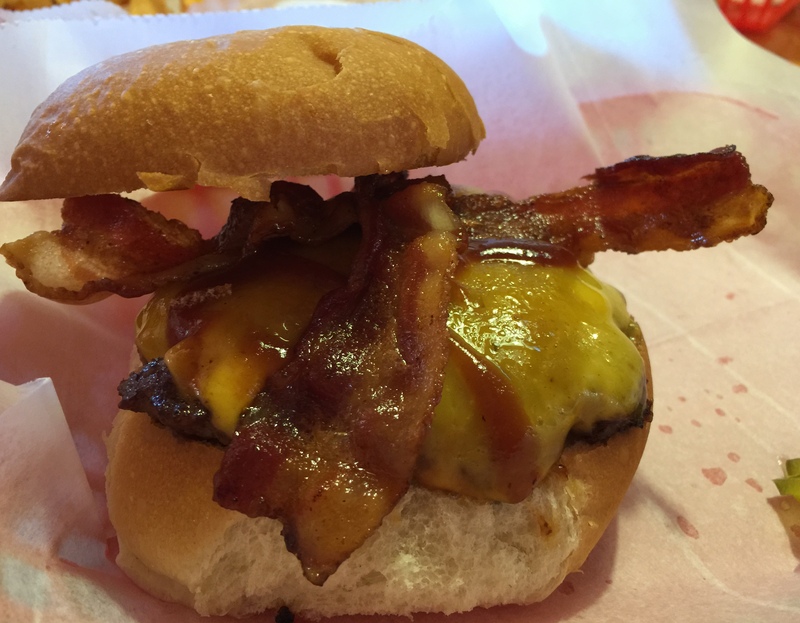 The Cowboy Burger was topped with bacon, bbq sauce, and cheddar cheese. Because we had to conserve stomach room, we ordered the 1/4 lb burgers. You could also get 1/2 lb. versions for a couple bucks more. 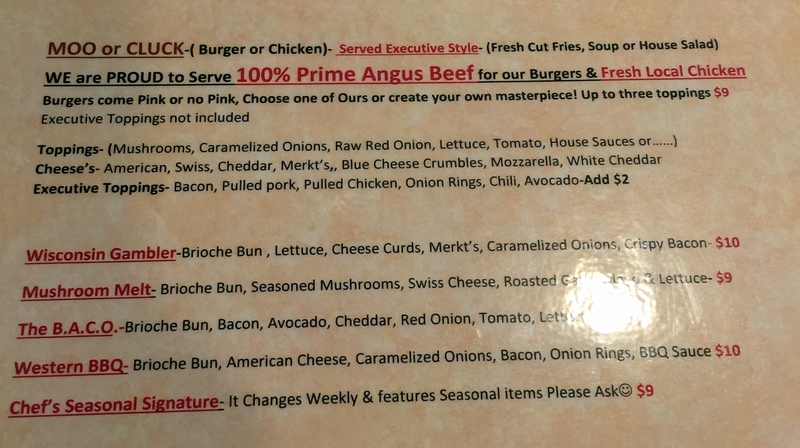 Some of the other choices include Horseradish Burger, Cajun Jack Burger, Nacho Burger, Roasted Garlic Burge, and the Fred Burger which was topped with sauteed onions, ham, green peppers and swiss cheese. See the menu here. We were very happy with the flavoring of the burger meat, the toasted bun, and the bacon was good quality. Some of us didn’t love the Fred’s famous melted cheddar because it was (a) messy (have napkins ready) and (b) slightly synthetic tasting. Think a slightly thicker movie nacho cheese, No doubt, the Cowboy burger with the regular cheddar was a great burger. 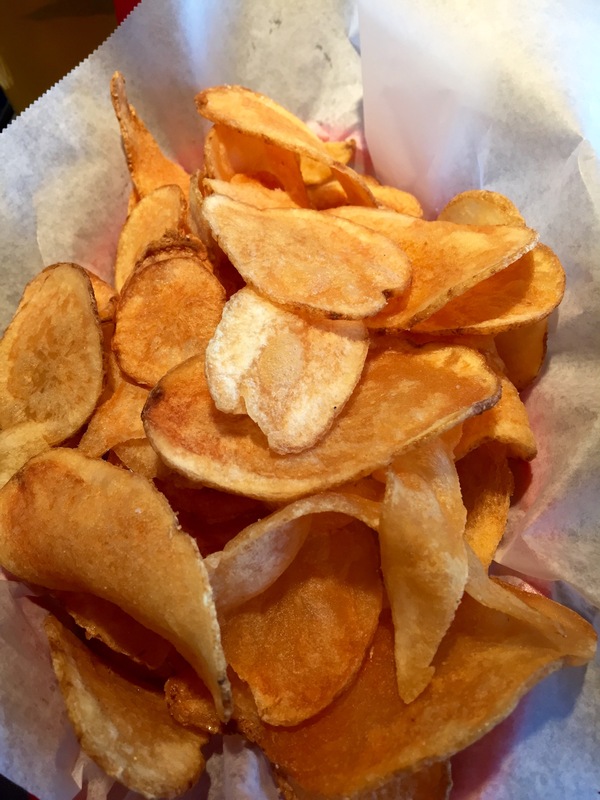 Fries or homemade chips are extra; we ordered both. Unfortunately both of these were undercooked and not the best. A little additional time in the fryer would have made a huge difference. As a side we tried Fred’s garlic aioli and it was good, super garlicky and would be a great topping for a burger. This place received a couple of mentions on our Facebook group and if I were to judge this book (diner) by its cover, I would assume that it served mainly breakfast with a few lunch items; maybe a hot beef and gravy or a burger with bacon being the wildest topping. I would be WRONG. The outside is unpretentious and it is actually connected to a clean, updated bar called Gamblers Tavern where we walked over and got a few beers and brought back to our table. 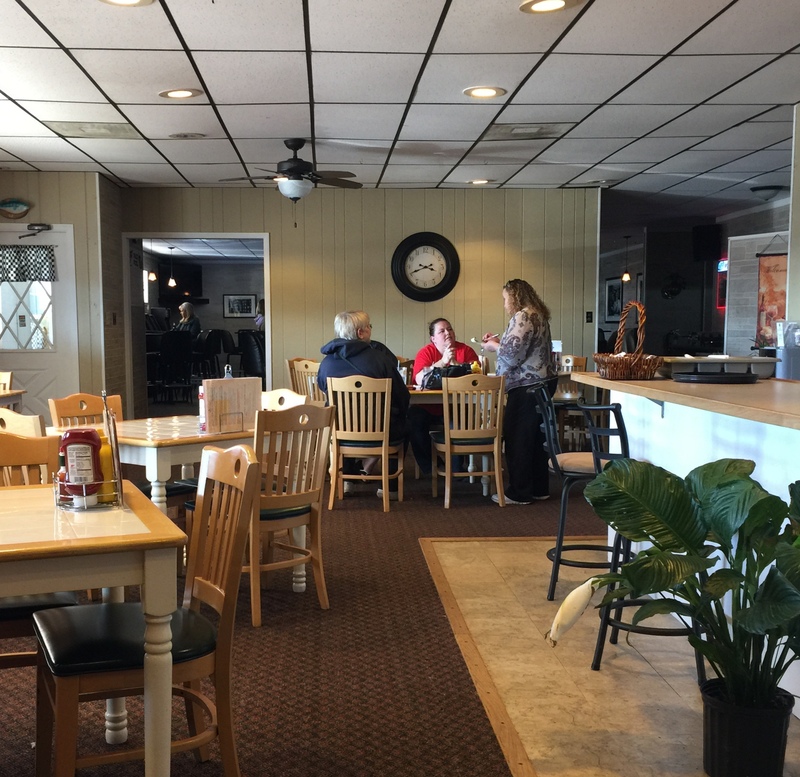 The decor was “country breakfast diner” which was a pleasant surprise being connected to a bar. The place was spotlessly clean and waitress (Sandy, who looks like Bette Midler) was a seasoned, boisterous character who used to be an owner of the Bunker in Waterford. 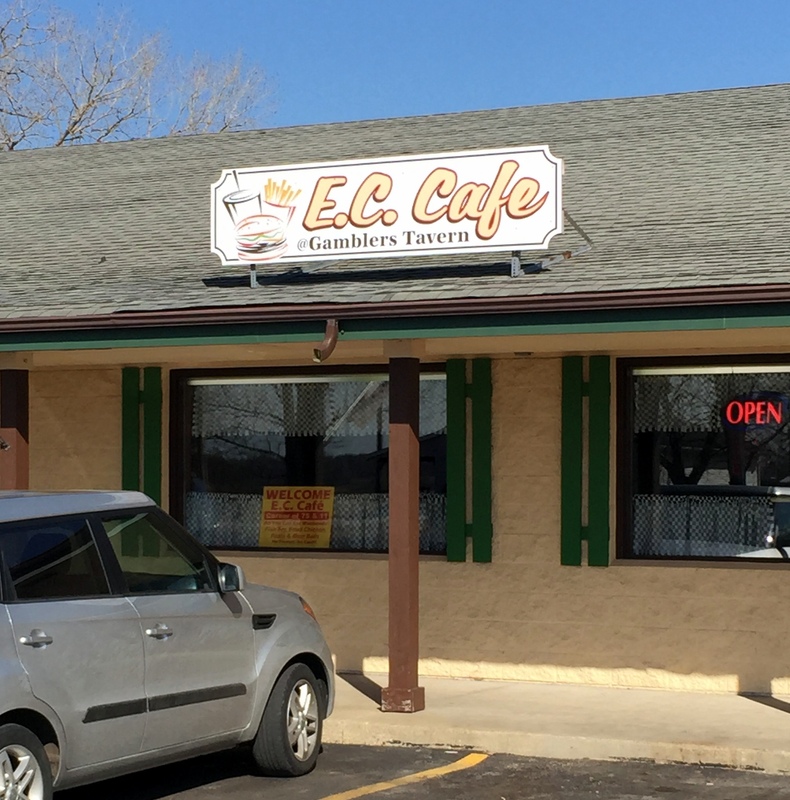 Apparently, EC Cafe has only been open for a little over than a month, and the owner (who also cooked our burgers) has a catering business as well. A little research shows Paul Benigno, the owner, did his training at Le Cordon Bleu culinary school in Chicago. 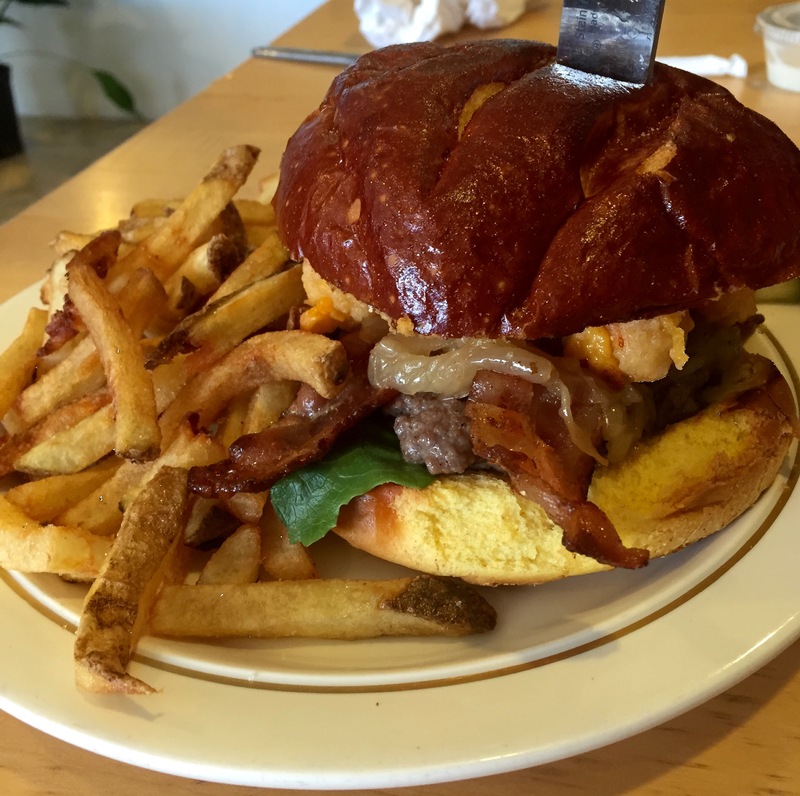 EC Cafe offers four designed burgers along with a build your own option. 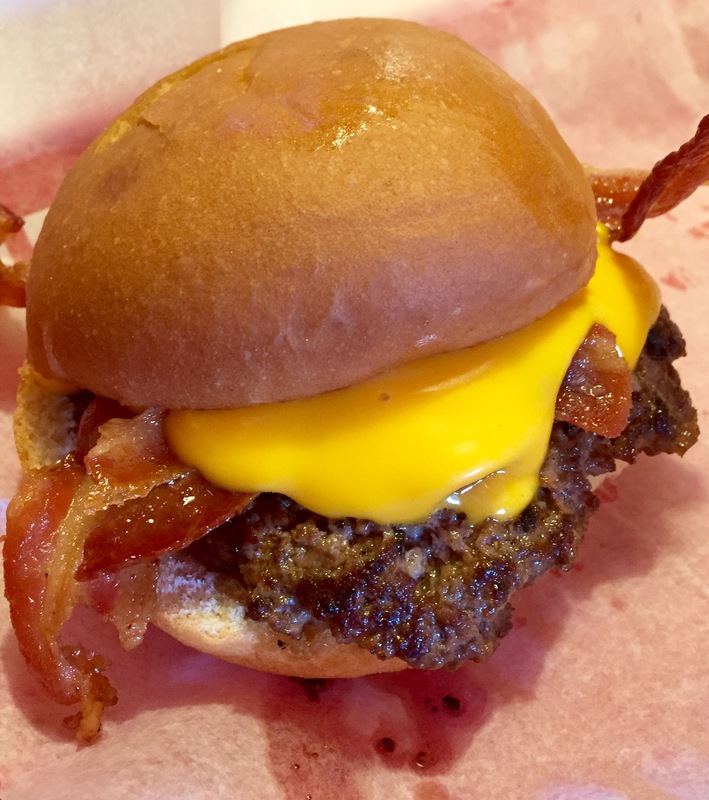 Bacon was quality stuff, and all burgers came on a brioche bun, (a little more toasting would have improved the bun and maybe made this our overall favorite). Waitress asked if we wanted “pink” or “no pink”. The burgers here came with fries, and soup or salad. If you are expecting a rock bottom deal on a burger in this one stop-sign town, its not exactly that, but its certainly not overpriced. All burger options are $9 to $10, but when you consider that this includes hand cut fries and homemade cup of the soup of the day or fresh small side salad with homemade croutons, that is a pretty good deal. The burgers were well cooked, large and the toppings were appropriately fresh. The burger could have used a little more seasoning, but its definitely better to have and under-seasoned burger than to have an over-seasoned burger that kills the meat taste. 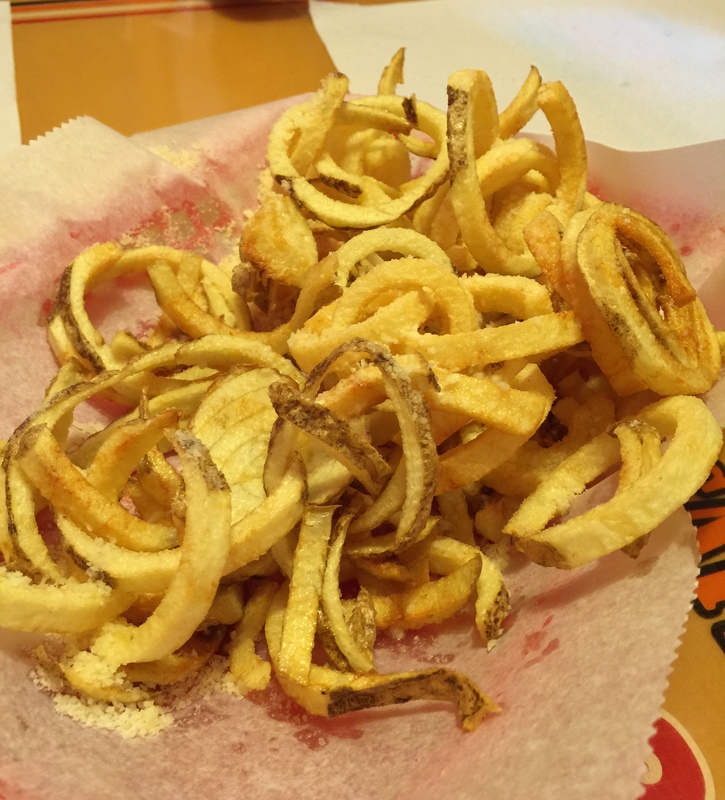 The fries were fresh cut and excellent, and the side salads were also well put together. I have had salads where the restaurant dumps a handful of iceberg mix in a bowl with a large pink chunk of tomato and calls it a day. 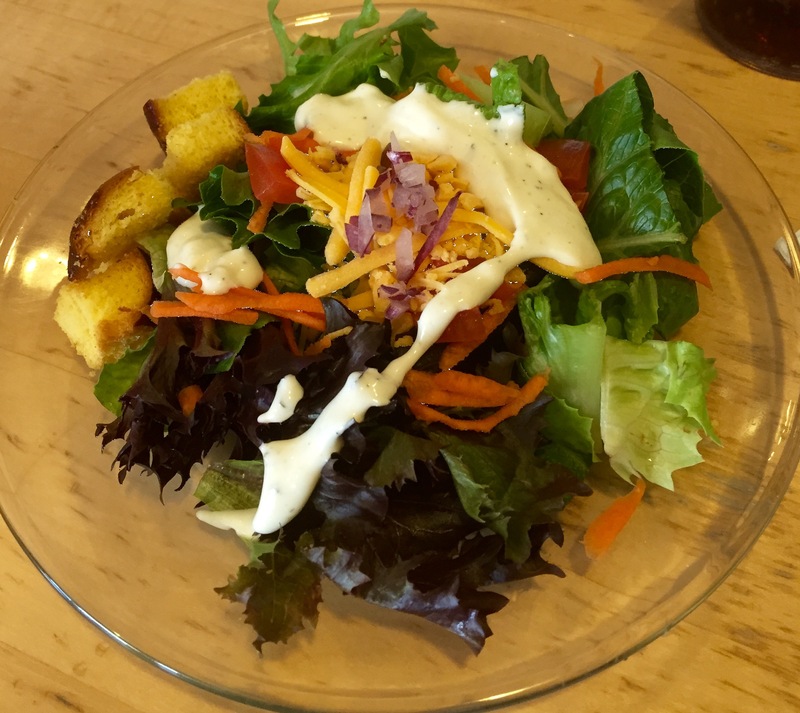 This was an above-average house salad. I can’t wait to try their breakfast and fish fry. 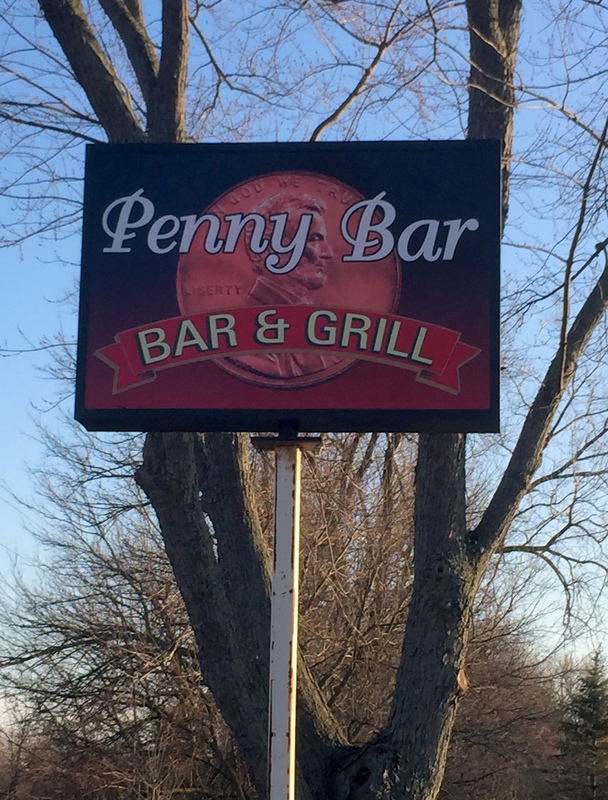 Penny Bar is in fact a clean, recently remodeled bar on Waubensee Lake in Wind Lake (just south of Waukesha and MIlwaukee Counties) The tables all had backless stools so not a recommended place to bring your younger kids. 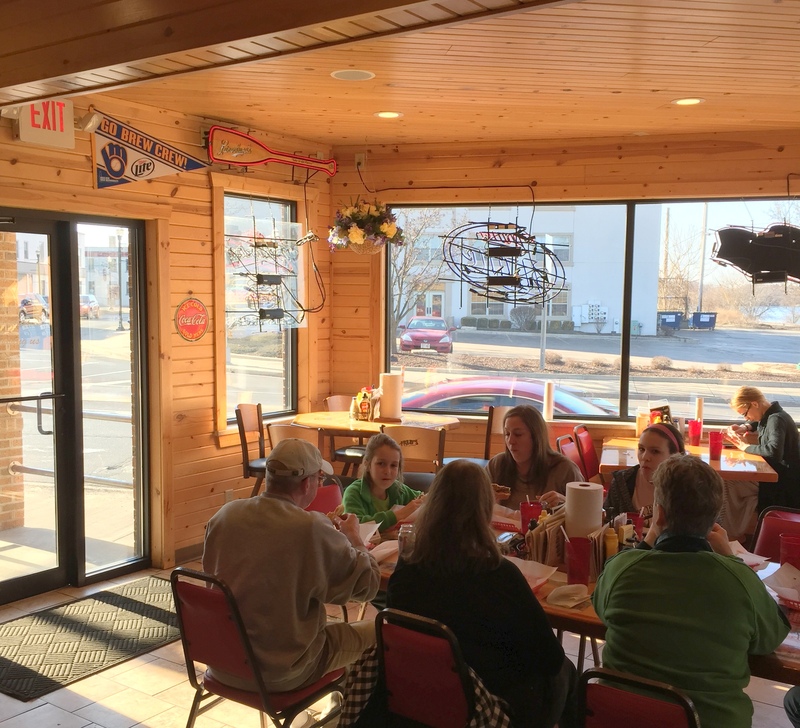 A couple of our members mentioned their burgers as being the real deal, even better than Fred’s, so we made it our third stop. 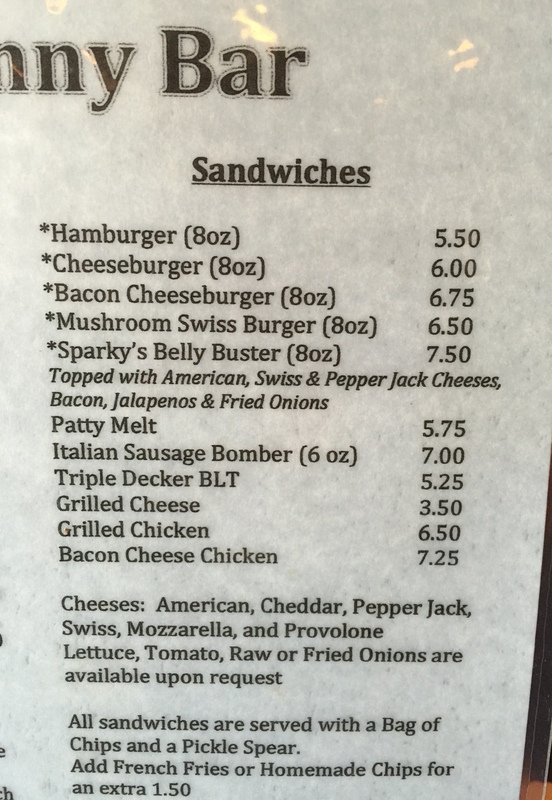 Penny Bar’s burger menu is exactly what you would expect in a small bar – the classic choices and one special, Sparky’s Belly Buster. We went with two classic cheeseburgers for $6.00 and some of the homemade chips. Penny’s cheeseburgers reminded me of a good version of the burger your mom and dad made on the grill growing up. Stealing the thunder from the burger at Penny’s was the toasted bun. This bun was generously buttered and toasted crisp with crunch in every bite. Although the hand-formed burgers at Penny’s had that good grill flavor, one of them we received was too charred on the outside leaving an unpleasant burnt taste. Penny’s homemade chips were sliced potatoes cooked crisp. 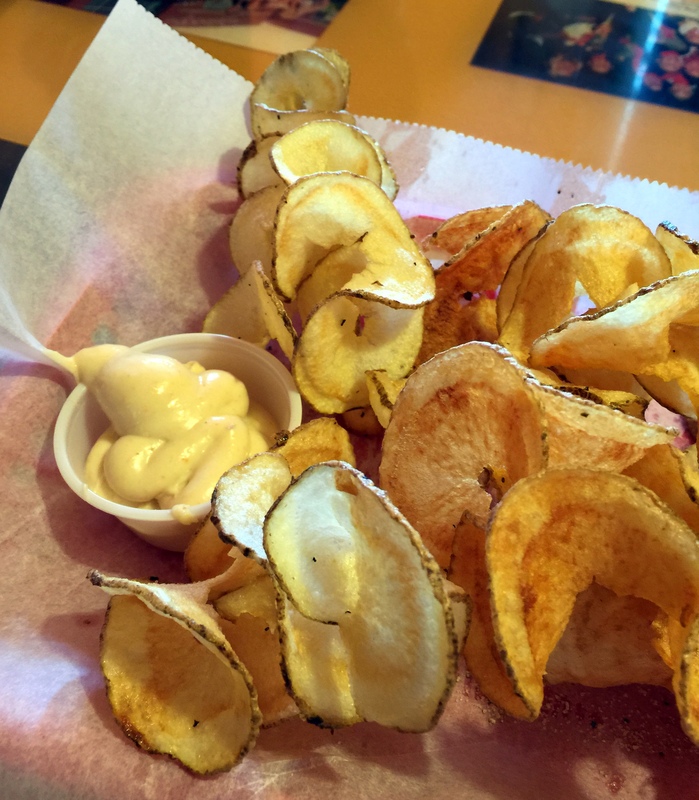 They were certainly better than a handful of Lay’s potato chips, but when you compare them to a place like the Yardarm’s Sand Dollars in Racine, these chips aren’t in that league (they are definitely playing AAA). So many places left for us to try, but do yourself a favor and take a Sunday drive for a burger. On the way, crank up some music, relax and travel some rustic roads in Western Racine and Kenosha County. That’s livin’ the good life. I would highly recommend The Penny Bar for there fish fry and pizza also.